This Marie Osmond doll, Alice, is dressed in the traditional blue dress with a white apron. Like the beloved literary character, she's dressed in a light blue Swiss polka-dotted sheer organza dress with a white eyelet pinafore apron, sheer white tights, and black faux velvet shoes. 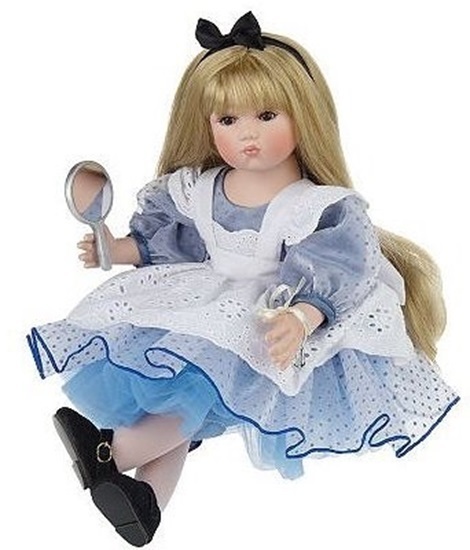 Alice has long blonde hair, tied with a black headband, and she is holding a mirror. She was sculpted in porcelain by Beverly Stohr and is a limited edition of only 400. Alice measures 11 inches high when seated and comes with her C.O.A., and has Marie's fascimile signature on the back of her neck.